And, somehow, here we are again. It's the day before Thanksgiving and all the comic book crazies are rushing to the LCS to stack up on plenty of reading material for the (hopefully your office is giving you a) long holiday weekend. For my part, I'm looking forward to grabbing my books and spending some quality time (trying to) catch up on all the missed reading I've accumulated recently. And, you know, eating lots of food, watching football, and spending quality time with the family. I write about it every year, but the Wednesday before Thanksgiving is my favorite comic book day of the year. Typically, the store is a little more crowded and customers are in a pretty good mood overall. Having a couple of days off (and the promise of copious amounts of food) tend to do that to even the most cynical amongst our comic book brethren. What's more, though, the publishers usually have lots of stuff ready for this week--and there's usually some really good books in there. Today we have a new hardcover collection from DC. And it features Batman. 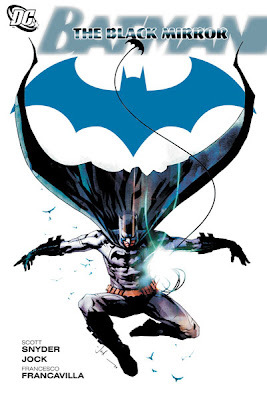 So if I'm recommending a Batman book, you know it has to be good. Despite some...strangeness...with the character in recent years, DC has returned the Dark Knight to his core characteristics. And here's where that all started. From writer Scott Snyder and artist Jock, Batman: The Black Mirror hits stands today and features the return to Batman's detective roots. The first six issues of an eventual year-long run on the character, The Black Mirror hits all the right notes for old school Bat fans. First, in "The Black Mirror," a series of brutal murders pushes Batman's detective skills to the limit and forces him to confront one of Gotham City's oldest evils. Helpless and trapped in the deadly Mirror House, Batman must fight for his life against one of Gotham City's oldest and most powerful evils! This collection is the first part of what really was an excellent year of Batman stories from Snyder, Jock, and others. If you didn't pick it up monthly, think about adding this to your Thanksgiving reading pile. Speaking of Thanksgiving, I need to do some work. So I can actually go home for Thanksgiving. Before I go, though, what are you Waiting for?